The Sign of the Cross – Used Differently? I have noticed that there are certain times during the service that Episcopalians acknowledge words spoken by the sign of the cross, but Lutherans do not. Why is this? Pr./Fr. Nathaniel: It’s interesting the things we notice worshiping “in the round,” isn’t it? Great question! When you look at the liturgical rubrics (little red italicized words in worship books that tell you what to do), both Lutherans and Episcopalians traditionally make the sign of the cross for two reasons. The first relates to baptism. When the Triune God is invoked we make the sign of the cross to remember that we were baptized “In the name of the Father, and of the Son and of the Holy Spirit.” This can also be done when we enter the church and touch the baptismal waters, or during the words of the Creed that place our hope in the final promise of our resurrection (“The resurrection of the Body” in the Apostle’s Creed and “We look for the resurrection of the dead” in the Nicene Creed). The second time you see people make the sign of the cross is related to blessing. When the priest blesses us we make the sign of the cross, regardless of whether the Trinity is mentioned. This happens at the conclusion of the Eucharistic service as well as Morning and Evening Prayer. There is a third time we often make the sign of the cross, but it is really related to blessing. 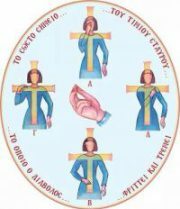 It is common to make the sign of the cross during the sanctus (the singing of “Holy, Holy, Holy” during communion) when we get to the line, “blessed is He who comes in the name of the Lord.” Most liturgical scholars think this developed when the assembly heard the words “blessed is he…” and assumed it was another occasion in which they were blessed. Most Lutherans and Episcopalian liturgical scholars think the sign of the cross does not need to or should not be made there, but old habits die hard. I myself have made the sign of the cross at that point since I was little —and old habits die hard! There is also the practice of crossing your forehead, lips and chest during the proclamation of the Gospel. This is a largely Roman practice that many Episcopalians and some Lutherans have adopted as we pray that God’s word enter our minds, lips, and heart. Overall, the practice is a way to involve our whole body in worship. Episcopalians and Lutherans don’t generally dance in the aisles and raise their hands in the air (though many certainly do). But even we more reserved Christians can pass our hand from our forehead to our chest, to our left and right shoulders as we recall that God has claimed us as beloved Children in the waters of Holy Baptism and that we are indeed richly blessed.